It is always convenient and frequently necessary to know the exact amount of stock required to make a given piece of work. There are four general methods used for determining this. The first and most accurate method, if it can be used conveniently, is mathematical calculation. Taking as an example the bent piece illustrated in Fig. 53. If the outside of this is measured, it would seem as though 16 inches of stock were required. If the inside is measured, 14 inches would seem the proper amount. It has been found by experiment that if a piece of straight stock is taken and a line drawn on it through the center, and this piece of stock then is bent and the lengths of the inside, center, and outside lines be measured, the outside line will lengthen considerably as the piece is bent. The inside line will shorten correspondingly, while the center line will remain comparatively unaltered in length. This is universally true, and the proper length of stock required for making any bent shape may always be obtained by measuring the center line of the curve or bend. To return to the first example: In this case, if the center line of the stock be measured, 7 1/2 inches will be the length for each leg, thus making a total of 15 inches of stock required to make that particular bend. This is a universal rule which should always be followed when measuring stock, to take the length of the center line. Fig. 63. 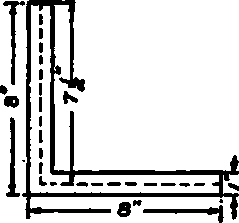 Diagram for Calculating Stock in Bent Piece. Fig. 54. 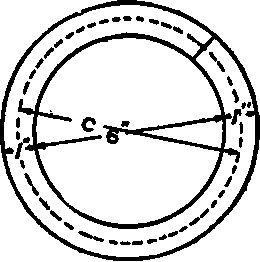 Diagram for Calculating Stock in Ring. On circles and parts of circles the length of stock may be easily calculated. The circumference, or distance around a circle, is found by multiplying the diameter by 3 1/7 or, more accurately, 3.1416. As an illustration, the stock necessary to bend up the ring in Fig. 54, would be calculated as follows: The inside diameter of the ring is 6 inches and the stock is 1 inch thick. This would make 7 inches the diameter C of the circle made by the center line, which may be called the calculating diameter, and the length of stock required would be 7X3 1/7 or 22 inches. 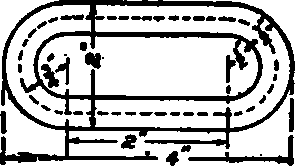 A combination of circle and straight lines is illustrated in Fig. 55. This link may be divided into two semicircles at the end, with two straight pieces at the sides. The outside diameter of the ends being 2 inches, would leave the straight sides each 2 inches long. The calculating diameter for the ends would be 1 1/2 inches. The total length of stock then required for the ends would be 1 1/2 X 3 1/7 = 4 5/7, or approximately 4 11/16 inches. As each of the straight sides would take 2 inches of stock, the total length required would be 4+4 11/16 =8 11/16 inches. With a slight allowance for welding, the amount cut should be 8 3/4 inches. 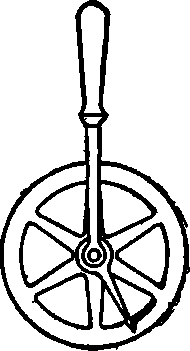 Another method of measuring stock is by using a measuring wheel such as is shown in Fig. 56. This is simply a light running wheel mounted on a handle with some sort of a pointer attached. The wheel is sometimes made with a circumference of 24 inches and the rim graduated in inches and eighths. To use it, the wheel is placed lightly in contact with the line or object which it is wished to measure, with the zero mark on the wheel corresponding to the point from which the measurement is started. The wheel is then pushed along the surface following the line to be measured, with just enough pressure to cause it to revolve. By counting the revolutions and parts of a revolution made by the wheel, the required distance may be easily measured. Fig. 65. Diagram for Calculating Stock in Link.